Owning your own home is one thing, owning a literal dream home that essentially feels as if you're perpetually on a holiday is a whole another story. 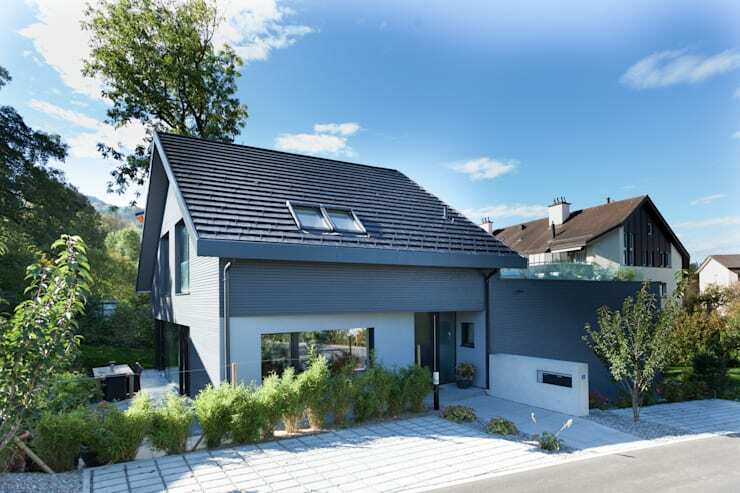 And so, we're legitimately equal parts impressed and envious of today's 360° project—an elegant family home oozing with understated style in the little town of Hafnerbach in Austria. 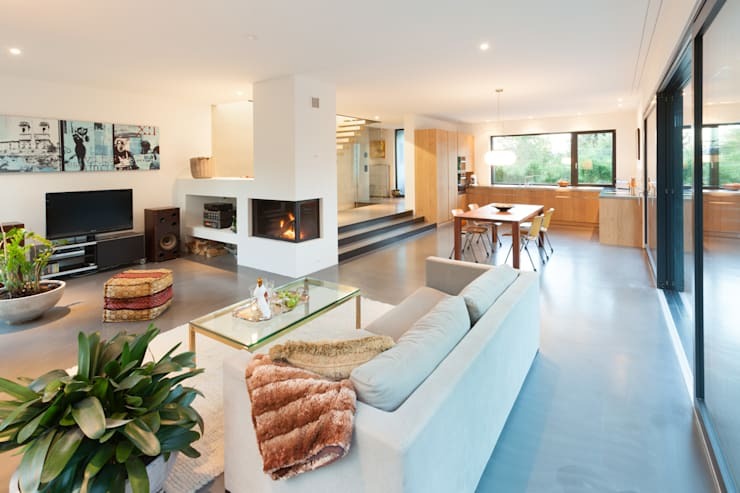 It's an expansive home that tells a different story from every angle; just as you get used to the idea that this is a stylish yet simple contemporary home, you move onto a completely different architectural feature that makes you wonder if this is actually a holiday home. 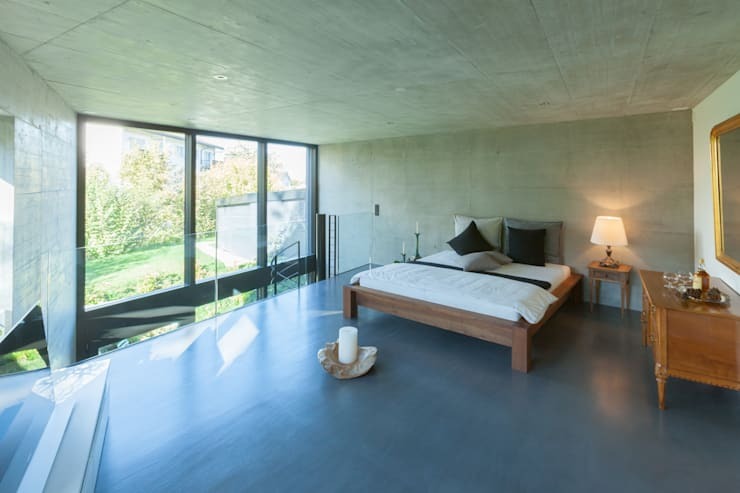 Designed by the Austrian-based architecture firm Von Mann, this dream uses natural materials, understated hues and glass to great effect. When you have a home like this, you are not going to be hankering to go on a holiday too soon! You wouldn't think it when you see the space now, but this area was once considered irreclaimable, owing to the fact that any structure would have to comply with the minimum distance that needed to be maintained with the adjoining street. That meant narrowing down the building site to a tremendous degree. The architects took this on as a challenge and within a year's time, this dream home with a floor space of 145 sqm was realised. From this angle, the one that opens out onto the street, the house has a distinctly modern contemporary look and feel to it. Step off of the main street and down a short flight of stairs and you come to this—the entrance of the house. You can see the distinctive and unconventional outline of the house here, a decision that was heavily influenced by the distance limitations placed on the architects but one that has paid off in spades by the look of it! The huge glass windows are framed by the same dark wood panelling seen earlier—an aesthetic choice that allows the house to blend in seamlessly into its natural surroundings. It is always a challenge when it comes down to the interior design of a long and fairly narrow space. Here though the architects have done a fantastic job. They've created a free-flowing space with the dining table as the central zone and the living room and kitchen flanking it. By placing the couch in the central line of the room, instead of having it backed up against a wall, the space appears more communal and intimate. The cool grey concrete floor and the white walls makes the already airy space appear even brighter by bouncing light off of its surface. Even if you're the most anti-social being on the planet, you have a terrace like this you're going to want to entertain guests just to show off. Before we forget, this terrace also has a pretty good view of the Swiss Alps. This gorgeous terrace is accessible from the second floor of the house. 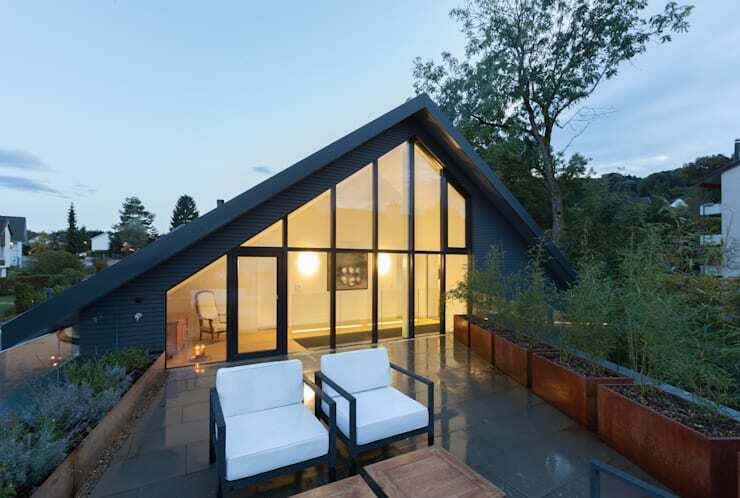 Thanks to the space being designed a little off-centre (another consequence of the limitations) to the overall structure, the gabled roof and the floor-to-ceiling glass panels create a unique visual appeal. If you want to build a dream terrace like this, we suggest talking to our experts here. A climb up a spiral staircase takes you to this charming bedroom with an industrial edge. We absolutely love the glass balustrade that signals the perimeter of the bedroom. The industrial feel of the concrete walls and flooring is softened by the vintage furniture and accessories. Your eyes are taken away from the fairly low ceiling thanks to the ginormous glass windows that lets light and the surroundings in. Who wouldn't want to wake up here? 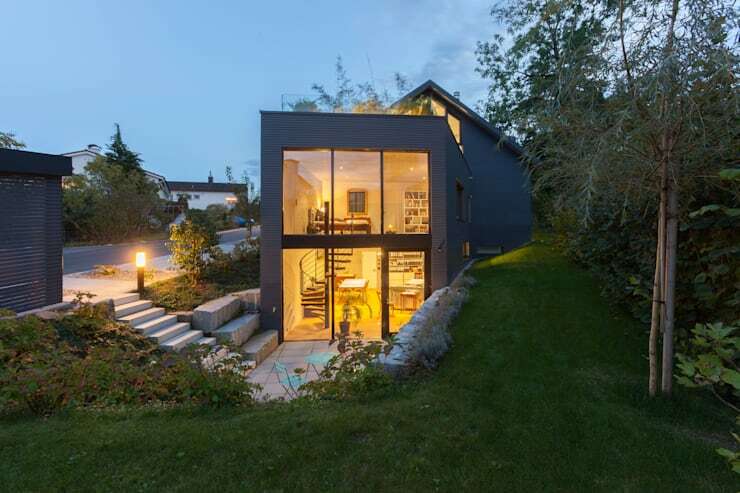 Check out another stunning home here: A Nordic family home in Japan. What did you think of this dreamy family home?